The market for horror comics right now is brutally competitive. With books like Locke and Key, Green Wake, and Rebel Blood reinventing what can be done with a genre, competition is fierce. The Evil Tree, being an independent horror comic published by a small press, faces some challenges when stacked up against titles from Image Comics and IDW Publishing. Which is a shame. Even though The Evil Tree is a by the numbers horror story, this book’s expert writing proves that there is nothing wrong with a good old fashioned ghost story. At its core, The Evil Tree is a very simple story. It is your standard unsettled ghost haunting the living as a means to eventually rest in peace. This book’s storyline is fairly cut and dry and, in this case, it is perfectly okay. Writer Erik Hendrix seems to understand that sometimes mastering a preexisting story can be more appealing than poorly tackling some high concept horror story. Why try to blow people’s minds by ruminating on the human condition if you can’t even get it right? 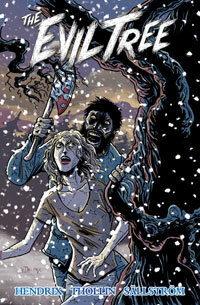 In The Evil Tree, Hendrix leaves well enough alone and crafts a wonderfully paced, genuinely frightening graphic novel. This seems to be what sets most successful horror comics apart. A writer’s over ambitiousness often tangles up a story. Fortunately, The Evil Tree is single-minded in its approach. Artist Daniel Thollin creates some truly tense moments throughout this comic. As characters pace through abandoned hallways and across frozen lakes, Thollin illustrates everything with an unsteadiness that will set you on edge. Limbs and ghouls tentatively creep around the panels of The Evil Tree reminding you that something terrible is lurking in the dark. This specific style of art lends itself wonderfully to this book’s streamlined tone. Thollin doesn’t try to accomplish anything too flashy or provocative with his artwork. Instead, The Evil Tree is a well-drawn, beautifully simple graphic novel. Recommending indie comics is always a tough call to make. With comic shop shelves being lined with big name horror comics, picking up an independent press comic can be a gamble. In this case however, The Evil Tree stands should to shoulder with the best out there. This is a comic about a group of friends surrounded by a living ghost story and it will scare the hell out of you.